Do you nimbys use the motorways and railways? Today the Coalition Government has announced the second phase of HS2 – the new high-speed railway network connecting London to the North of England. As regular readers of this blog know, it takes a lot for me to congratulate the Coalition Government but when they are doing something which actually makes sense and is worthwhile, I won’t shy from congratulating them. Unlike the OAP nimbys who are complaining about HS2 shuddering over their graves when it is finally completed in 2033 I am wholly in favour of this infrastructure project. 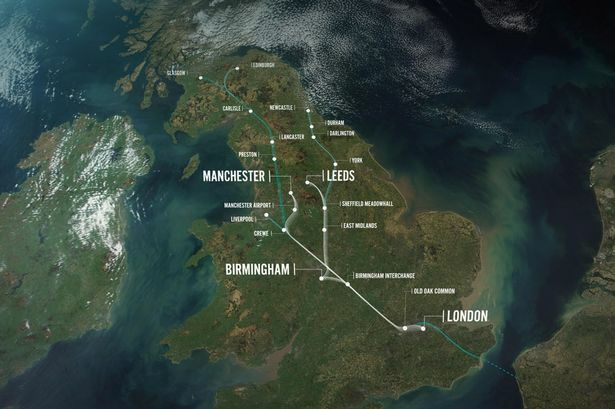 The new rail network will be Y-shaped and once the first phase (as I reported a year ago) from London to Birmingham is completed it will split into two high speed mainlines, one to Manchester and the other to Leeds. This will be an excellent piece of engineering which will enable an economic boost during its design and construction, with 100,000 jobs expected to be created, and when it is finished it will increase trade between the capital and our great northern cities. It will do this by cutting journey times between Manchester and London from two hours, eight minutes today to 1 hour, 8 minutes. This will be a real step towards narrowing the North-South divide. It makes me angry that men and women in the twilights of their lives, in particular those whiling away their days on local councils and who have been popping up on our 24 hour news channels today, are mounting campaigns against HS2. Have they been on a train? Have they used a motorway? Perhaps they shouldn’t if they are so set against development and faster communications? These nimbys are only concerned with their pretty little affluent villages, where no person under 40 can dream of affording a house, being too close to the new line. But what about the benefits in bringing the economic powerhouse of Britain closer to the rest of the population, increasing trade and jobs? They haven’t given it a second thought. Compare this to a small town called Toton which will be the site of the East Midland HS2 railway station serving Derby and Nottingham where local residents are on the whole delighted their town has been chosen to site one of five new high-speed railway stations. They did the maths and realised the benefits. As much as I am very positive about HS2, the announcement today highlights again how the East of England is severely neglected by Whitehall when it comes to infrastructure improvements. There isn’t even one motorway in the whole of East Anglia. We have a railway line from Norfolk to London but it is in an appalling condition, with ubiquitous signalling faults, only one line north of Chelmsford, and by the time HS2 is built it will be faster to get from Birmingham to London (49 minutes) than it is from Ipswich to London (one hour, fifteen minutes). Three weeks ago (as reported by Ipswich Spy) Network Rail published their proposals for investment on the Great Eastern Mainline but the £1.4bn required to mainly renew signalling and overhead power lines still must be approved by the Department for Transport for the money to be released. Even if the investment is green-lit by Transport Secretary Patrick McLoughlin it is merely tweaking around the edges as no plans are in place to lay additional tracks north of Chelmsford. With only one line north and one line south, all it takes is a broken down freight train on its way to Felixstowe to cause chaos for commuters trying to limp home late at night from their jobs in London. Why is it that successive Conservative and Labour MPs in Norfolk and Suffolk neglected the East of England for so long when it came to urging ministers to invest in our roads and railways? It showed a complete lack of foresight. It is great to see Ipswich’s MP Ben Gummer working hard to turn things around with his constant lobbying for the town in the corridors of Whitehall but if his father – now Lord Deben – had been just as forthright when he was MP for Suffolk Coastal for thirty years we could have had a journey time of less than one hour between Ipswich and London today in 2013. Instead, we have the prospect of our Brummy friends getting to London, over 120 miles, quicker than it takes an Ipswich commuter over 80 miles. Now, where’s nice to live in Birmingham I wonder? Categories: HS2, railway | Tags: Ben Gummer, economy, Great Eastern Mainline, HS2, Ipswich, nimbys, Patrick McLoughlin, Toton | Permalink. To add to his achievement last year in gaining Academy status and a new building for Holywells High School – now renamed Ipswich Academy – Ipswich MP Ben Gummer has scored again by ensuring Chantry High School is also re-built by ensuring it is in the Government’s Priority School Building Programme. Mr Gummer may have his faults, especially on his agreement with the fantasy science of global warming and somewhat perverse views on Europe, but he is an excellent advocate for Ipswich in Westminster. He genuinely cares about the town and its people and this is borne out by the effort he puts in to bending the ears of ministers to ensure money flows East to our hospital, our schools and I hope in the future our dreadful railway. Public money coming to Ipswich doesn’t happen by accident. I would bet most Whitehall mandarins and probably a fair few Government ministers wouldn’t be able to place Ipswich correctly on a map of the UK. I personally had to look Ipswich up on a map when I got an interview at BT’s R&D labs back in 2000. So I know Mr Gummer has to work very hard to get the decision-makers in the Coalition Government to take Ipswich seriously. And by taking that logic further, it shows how little effort the former Labour MP Chris Mole put into his primary job of representing Ipswich people. Mr Mole was more concerned about climbing the greasy pole and representing the Government in Ipswich (remember the scrapping of Heart Care services at the hospital) than fighting hard for his constituents. I now expect Alasdair Ross and other Socialist apparatchiks to start telling me in the Comments below that Chris Mole worked through thousands of cases, answering countless letters etc etc. All well and good but that is the level I expect from a Councillor. I expect my MP to possess exceptional skills of persuasion and communication and then use them effectively within the Whitehall machine to work the system for the benefit of his or her constituency. Frankly, Mr Mole didn’t have those skills whereas Mr Gummer has them in spades. Even when Chris Mole was made a junior transport minister, he spent more time looking at the modern West Coast mainline than the dilapidated and awful Great Eastern line! The guy couldn’t have done less for Ipswich if he tried. With a new school building for Chantry High School and the new Ipswich Academy combined with Education Secretary Michael Gove’s reforms, we may be able to reverse the decline in educational standards in Ipswich and Suffolk. Labour, of course, don’t want this to happen. They would prefer it if children still left school with poor literacy and numeracy skills as then it is easier for their councillors and activists to dampen their aspirations to better themselves. People who have ambition and the skills to match tend to swing towards Conservative values of thrift and hard work as this eventually pays good dividends – and I don’t mean the Co-op variety. But Labour do not want people to have a good education – as they might end up voting Tory! Categories: Ben Gummer, Chantry High School, Chris Mole, Ipswich, Ipswich Academy, Priority School Building Programme, railway | Permalink. I had heard about this on the grapevine but Ipswich MP Ben Gummer confirmed it in his weekly Morning Ipswich Star column (not online) on Friday that National Express used a grant from a government quango to install a Wireless network on-board their trains and then CHARGED passengers to use the new WiFi service. “Now, I received an interesting little booklet through the post the other day, from National Express. Clearly keen to ensure they can bid again for franchises, the pamphlet trumpeted their achievements on our line between 2004-2012. Peak seating was increased by 11,000 seats, an improvement of 18%; the Ipswich to Cambridge service was upgraded; punctuality (on a loose definition of the word) went from 85% to more than 90%; wifi was introduced on the mainline; an hourly Ipswich to Lowestoft service was introduced; there was increased service frequency across the region, and fewer trains were delayed and cancelled. So the former train operator for the Greater Anglia mainline and branch services took cash paid by you and I in tax from the now defunct East of England Development Agency – set up by the regionalisation lunatics in New Labour – and then had the audacity to force us to pay the money again to access the WiFi service paid for by us, the passengers. You couldn’t make it up. Come on, Abellio (now known as Greater Anglia): give us free WiFi from tomorrow! Categories: Abellio, Ben Gummer, East of England Development Agency, Greater Anglia, National Express, railway | Permalink. Today I attended a public meeting at the St Nicholas Centre on our railway service, especially the Great Eastern mainline between Ipswich and London. On the platform with Ipswich MP Ben Gummer, who organised the meeting, was Dave Ward, regional director for East Anglia and a very senior representative from Network Rail who reports directly to the MD, and James Steward, a National Express East Anglia spokesman (and soon to be TUPE’d across into Abellio, the new Great Eastern operator). The BBC and Morning Evening Star reporter Paul Geater were also in attendance. The meeting gave those who attended (unfortunately only about 30 turned up) an opportunity to vent their anger for having to pay a small fortune for a diabolical railway service. The audience, although small, was nonetheless representative of commuters and travellers: young, middle-aged and retired. After about 40 minutes of speeches from Network Rail and NXEA the floor was opened up to questions. Everyone was scathing of the service, with particular hostility targeted at the NXEA representative, James Steward. Some of the topics raised were trains consistently delayed, cleanliness, lack of information, rude station staff. One chap even raised the point there was no clock on the front of Ipswich station, which I followed up moments later by explaining there were no visible clock from platform 1 and I challenged Mr Steward to get one erected within the next 4 to 6 weeks! The Network Rail representative at this point had his head in his hands not quite believing what he was hearing. I also raised the issue of the rolling stock, which are hand-me-downs from the West Coast Mainline: why is it that the carriages inside were so dirty and the toilets disgusting? The NXEA representative nodded and agreed it should be better but fast turnarounds at Liverpool Street (usually because the train from Norwich was delayed in arriving) meant it was not always possible to ensure the carriages were completely clean. I challenged him to at least ensure there was soap in the dispensers, that the pedals to pump the water to the taps work and the towels pull through. From the reaction of the audience it was clear many understood first-hand the points I was making. Mr Gummer even relayed an experience where he had dispensed soap on to his hands in one NXEA on-board toilet only to realise there was no water…unfortunately, I have first-hand experience of that too. The price of tickets were raised by nearly every member of the public who spoke but it was eloquently put by a young lady, probably in her 20s, who said she would soon be priced out of commuting to London and made the very serious point she would not be able to find like-for-like work in Ipswich. She also said it was “insulting” of NXEA to charge for WiFi when the travelling experience is so poor. Quite right. A season-ticket costs £5500 a year and NXEA charge for WiFi, a utility which should be treated like water: a case of immoral capitalism if there was ever one. Mr Steward from NXEA (soon to be from Abellio) responded as if it was the first time he had considered charging for WiFi might be wrong and said he would look into offering WiFi for free if customers would feel better about the train service as a result. Frankly, that is the least he could do. Time and time again NXEA said they appreciated our views. I retorted by saying I don’t want you to appreciate it, I want you to fix it. Mr Gummer also emphasised these weren’t views, they were facts. The Network Rail representative was impressive: he was very very well informed but then when you are that senior in an organisation I expect you to be. Some of the audience didn’t quite appreciate Network Rail was a ‘not-for-profit’ organisation, which Mr Ward had to emphasise. He was very much in favour of nationalisation though and said if Network Rail was privatised on the Monday he would leave on the Tuesday. One audience member put the case for privatisation of Network Rail, which Mr Ward vehemently opposed and cheekily said his view was not political, which of course it is. My view is privatisation would help to remove Network Rail inefficiency, which means the mainline is still closed on Sundays, 20 years after maintenance work began. But it would also probably mean less money, as shareholders and CEOs would want to ensure they took a handsome cut. Unfortunately, as Mr Gummer said, we need to work with what we have got today, which I tend to agree with. All in all this was a very useful meeting. At least now us weary commuters have some names and faces in senior positions to hold to account. Abellio will soon take over the franchise (a major press release is due out from them on Monday) for 29 months at which time the Government will invite tenders to pitch for a 15 year franchise, hopefully with caveats to motivate the operator to invest in better rolling stock and improve the time it takes to travel between Ipswich to London. This is not going to happen without close cooperation between the rail operator and Network Rail, which both representatives said was crucial, but even today I think this is one reason for such a poor service: one example is the complete lack of information for why a train is delayed. Finally, Ben Gummer is to be congratulated in pulling together this public meeting and getting the senior people from Network Rail and NXEA (Abellio) to attend. With the media presence and blog write-ups like this, hopefully the meeting will act as another catalyst to drag our railway service in East Anglia into the 21st century. And Mr Steward, I expect a clock up on platform 1 by 5th March! Categories: Abellio, BBC, Ben Gummer, Evening Star, Network Rail, NXEA, railway | Permalink. As we head back into the first working week of 2012, commuters are looking down the barrel of ticket rises well in excess of inflation and a railway line in the East of England which would have shamed a former Communist republic. At least our MP, Ben Gummer, recognises the problem and is addressing it at the highest levels of Government from the Prime Minister down. Just before Christmas, Mr Gummer had a meeting in the Houses of Parliament with his fellow MPs whose constituencies the Great Eastern line passes through between Norwich and London, Network Rail, the hated National Express and representatives from the new railway service operator Abellio, who will shortly take over the Great Eastern franchise for two years prior to the award of a 15 year franchise. Let’s not get carried away: not much was fixed at this meeting but a least the extent of the problem was laid bare to all the key players. Network Rail also admitted they were at fault for much of the infrastructure issues (i.e. track and signalling) – however, they were forced to make this admission by the fact delegates to the meeting were DELAYED on the mainline into London by signalling problems in the Stratford area (I’ve heard that one before!). I expect that we will see small but nonetheless important improvements in reliability and customer service in the next two years; new rolling stock in the next five to seven years; and faster journey times in the next decade to fifteen years. All of this is going to take hundreds of millions of pounds. But we will get it, because for the first time all the regions MPs are fighting for it. We know that we need those better rail links to bring jobs and prosperity to our towns and cities, jobs and wealth that will otherwise go elsewhere. When I read this I felt both pleased and disheartened at the same time. Pleased because at last our MP has given his constituents an action plan for improving our diabolical railway service but also disheartened because if his predecessors in both Ipswich and the neighbouring constituencies had pulled their finger out at the beginning of the century, when incidentally I moved to Ipswich to start working for BT, we would now be close to getting the railway service we deserve. Much of the blame for inaction must be laid at the door of Mr Gummer’s Labour predecessor: Chris Mole. He knew fine well that the railway service under “Anglia Railways” and then “One” was a disgrace and that it was having a detrimental effect on the Ipswich economy. He then became a rail minister under Gordon Brown. But what did he do over the nine years to improve the Great Eastern mainline service when he was our MP, latterly in the Government with responsibility for railways? Ah that’s right: a big fat nothing! Instead he wasted millions on A14 gantry signs which did not work and a pointless traffic lights scheme at Copdock. The guy should be barred from holding public office ever again. But, to be fair, the Conservatives should also take their fair slice of blame: Tim Yeo in South Suffolk, Sir Michael Lord in Central Suffolk and North Ipswich, and inconveniently for Ben Gummer, a certain former Member for Suffolk Coastal, Lord Deben (John Gummer), also sat back and took no discernible action during the 2000s. However, we cannot dwell on the past. Ben Gummer has a plan and I intend to keep the pressure on him to deliver the goods (and offer my support where I can). Categories: Ben Gummer, Chris Mole, Great Eastern, Lord Deben, railway, Sir Michael Lord, Tim Yeo | Permalink. Today my ultimate boss welcomed David Cameron to BT’s Adastral Park in Martlesham, just outside Ipswich, as the Prime Minister took his Cabinet on the road to visit the provinces. BT’s CEO Ian Livingston welcomed David Cameron and the full Cabinet, including Deputy Prime Minister Nick Clegg, to BT’s world renowned Adastral Park complex and showed the PM examples of BT’s cutting-edge technology solutions. The Prime Minister then held a Cabinet meeting on the site. I no longer work at Adastral Park day-to-day so, thankfully, did not have to experience the inevitable disruption that would have occurred as a result of the security operation. Our MP, Ben Gummer, met the Cabinet off the train at Ipswich and used the visit, amongst other things, to press home the need for improvements to the railway line between London and Norwich. Typically, the PM’s train was on time (a rare event indeed)! But I hope David Cameron noticed the crumbling rolling stock we ordinary commuters have to put up with on the mainline – and I hope he didn’t have to use the very poor toilet facilities! Mr Gummer has articulated well the issues we have with our railway infrastructure in the East of England and he is to be congratulated in getting David Cameron and his Cabinet to visit Ipswich (well some merely passed through Ipswich but never mind!) – now we need to see action and improvement in the railway, the rolling stock and the service. We will be watching. UPDATE: The BBC have a report on the visit to BT’s Adastral Park here. Categories: Ben Gummer, BT, David Cameron, Ipswich, railway | Permalink. Further to my post last week, I’ve learnt that my MP, Ben Gummer, is also suffering this evening on the railway line between London and Ipswich. He is furious and rightly so. There has been another suicide, the second in a week. As sad as it is, why has the poor soul been allowed to get on to the railway track in the first place and why does it take so long for British Transport Police to clear up the incident? Mr Gummer has articulated well the extent of the railway chaos on the Great Eastern mainline on Twitter this evening with one tweet having a particularly serious tone. I know he has been lobbying the Transport Secretary, Philip Hammond, for major investment on the mainline but I doubt in this current economic climate there will be much cash forthcoming. It is not just a matter of money but a case of tackling the RMT union, the incompetence of Network Rail and the lack of incentives for operators to invest in the track infrastructure. As a fellow Conservative has said, the extent of the problem is enough to withold one’s vote. Categories: Ben Gummer, railway | Permalink.